If you want to keep your old phone number after you got a new one, or you just want a second phone number to play around with, you can port that number to the awesome Google Voice service. Here’s how to do it. If you recently switched carriers and got a new phone number, but you want to keep your old phone number lying around just in case, you can port it to Google Voice so that you don’t have to pay for a second plan. Calls to your old number will get forwarded to your new one, and you’ll never miss an important call because someone forgot to update their address book. Sure, you can get a new phone from Google Voice and use it for texting and call forwarding too. However, if you have an existing number that you want to use with Google Voice, you can port it to the service and use that instead. First, porting a phone number to Google Voice requires a one-time fee of $20. Secondly, when you port a number to Google Voice, you can’t use the Google Voice app to send text messages–it requires a data connection over Wi-Fi or LTE/3G. You can, however, have Google Voice forward texts to your new number. When you reply to them using your regular messaging app, they will appear to come from your Google Voice number, which is pretty cool. The same goes for making and receiving calls–as long as you have call forwarding turned on, you can make and receive calls from your Google Voice number, even without a data connection. Your old phone number, which you are porting to Google Voice. This number must still be active when you start the porting process–do not cancel your account yet! Your new phone number, to which you’ll forward your Google Voice calls and texts. This can be a number on a new carrier, or on the same carrier you currently use. In my case, I was switching to a new carrier (Cricket), so I just started a new account with them, and ported my Verizon number over. When I did so, Google cancelled my Verizon account for me. If you’re getting a new number on the same carrier, you’ll just have to add a number to your account, after which Google Voice will cancel the old number for you. Make sure you aren’t in the middle of a contract, since porting your number could incur an early termination fee (ETF) from your carrier! If you aren’t sure, call customer service and make sure they make a note on your account not to charge you an ETF when you cancel. The first step is to head to www.google.com/voice. If you’ve never used Google Voice before, you’ll go through the process of accepting the terms and services agreement before you can start using it. Then you’ll skip these first few steps. If you’re an existing user, click on the settings gear icon in the top-right corner and select “Settings”. Select the “Phones” tab if it isn’t already selected. Next to your current Google Voice number, click “Change/Port”. Keep in mind that porting a number into Google Voice will replace your current Google Voice number after 90 days, but you can pay an extra $20 to keep that number (so you’ll end up with two Voice numbers). Next, click on “I want to use my mobile number”. If you’re a new Google Voice user, this will be the first screen you see after accepting the terms and services. Type in the phone number that you want to port over, and then click “Check for available options”. Click on “Port your number”. Click on the checkboxes and read all the things you’ll need to understand before the porting process. Then click “Next: Phone Verification”. The next step is confirming that you actually own and operate the phone number that you’re porting over, so Google Voice will call you at that number and then you’ll enter in the two-digit number shown on the screen on your phone’s keypad. Click on “Call me now” to begin that process. Once that process is done, enter in your carrier plan account information, like the account number, PIN, last four social security number digits, and so on. In my case, this was my Verizon account info. Then click on “Next: Confirmation”. Make sure all of the details are correct and then click on “Next: Google Payments”. If you have a credit card on file with Google, you can go ahead and click “Buy” when the pop-up appears. If not, you’ll need to enter in your credit card details before continuing. After the purchase, you’ll receive a “Purchase Confirmation” pop-up. Click “Done” to complete the process. On the next page, you’ll be reminded about a few things, like how your existing Google Voice number will be replaced (unless you want to keep it for $20 more), as well as how you’ll need to connect a new phone number to your Google Voice account as a forwarding phone. At this point, all that’s left to do is wait for the porting process to complete, which can take up to 24 hours, with text messaging capabilities taking up to three business days to fully complete. In the meantime, a yellow status bar will appear at the top in Google Voice, saying that your phone number is in the process of being ported. Once you have your old phone number ported over to Google Voice, you can use it to text message anyone, as long as you have a Wi-Fi or data connection, or they’ve texted you first with SMS forwarding turned on. The only way to make and receive calls through your old number is to use your main phone number as a forwarding number. In other words, whenever someone calls your old phone number, that call will be forwarded to your main number. 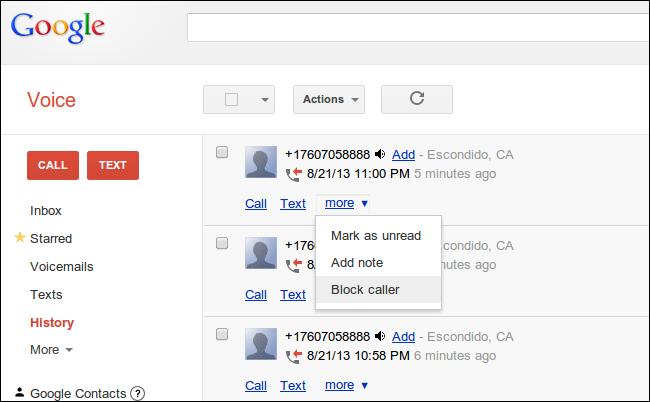 To set up a forwarding number, go back to Google Voice Settings and select the “Phones” tab like you did earlier on. Only this time click on “Add another phone”. Enter in a name for your forwarding number and type in the phone number below that. You can also select whether or not you want text messages to forward as well. If you want to configure even more settings, click on “Show advanced settings”. Within these settings, you can get direct access to your old number’s voicemail and even set when you want calls forwarded to you at certain times, sort of like Do Not Disturb (although Google Voice has an actual, separate Do Not Disturb feature). After you’ve customized settings, click “Save”. After that, Google Voice will call your forwarding number to verify that you own and operate it, and you’ll be prompted to enter in the two-digit number shown on the screen on your phone’s keypad. Click on “Connect” to begin that process. Once your number has been verified it will now show up under the “Phones” tab in Google Voice right below your ported number. You’ll see a new setting here: the ability to receive text notifications on your forwarding number whenever someone leaves a voicemail on your old, ported number. Check the box next to this if you want to enable it. At that point, though, your forwarding number is all set up and you’re good to go. If you ever want to make a call using your old phone number, you can do so from within the Google Voice app on your smartphone (if you have a data connection), or by calling your own Google Voice number to make a call. What Are Layers and Masks in Adobe Photoshop?